Spring is a time of birth and renewal - celebrate the season by creating a card for Easter or a bouncing new baby. Use the inspiration graphic as a starting point, or head off in your own direction - just show us your sprightly spring creations! I loved that springy wreath - such glorious colors to see after winter's end!! So I decide to create a wreath of sorts from the inspiration pic and used the flower stamp from the Coolest Chick stamp set from Verve stamps and stamped them around a cut circle and colored them in with copies. 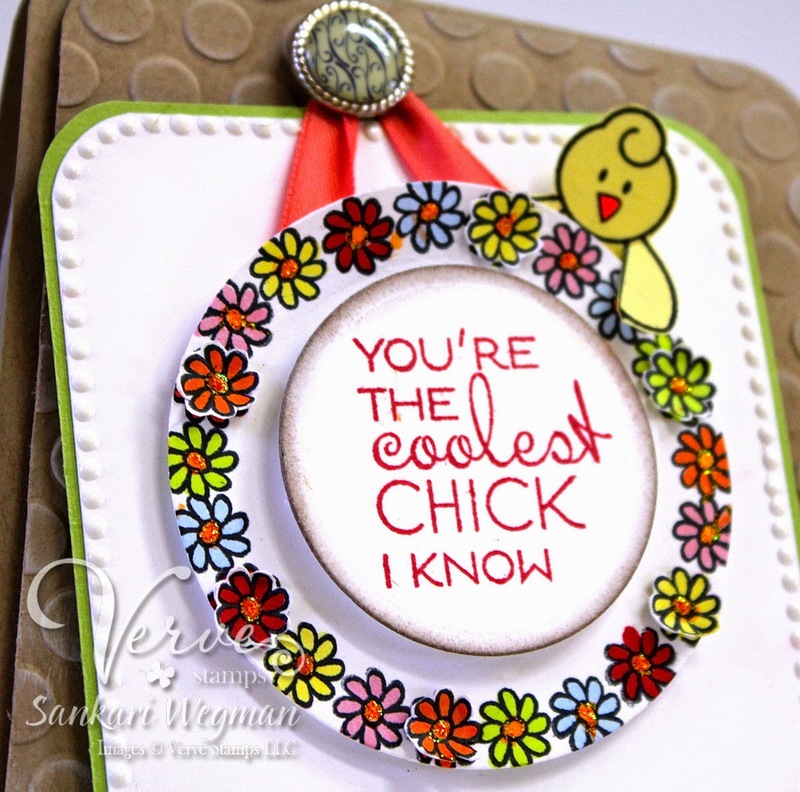 In the center, I stamped the sentiment: "You're the coolest chick I know"- LOVE the font on this and then popped a little chick from the set to peep out! 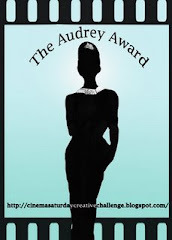 Challenge deadline: Sunday, Apr. 19. Fabulous card Sakari. Love the layering and the sentiment. What an awesome card! Love the kraft and the white inking you did on the background! Love your FUN card! So cute and cheerful! Hi Sakari! 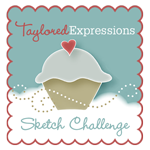 Love your oh so creative card! The wreath and chick combine to make a perfect girl card. So cute! Love the effect of the off-center hanging tag. I love the sentiment!!! Sweet card! Love the layers on this fun card. Such a bright and fun card! Great design. Love the flowers with some popped up here and there! What a fun card! I love it! Thanks for sharing wonderful card. LoVe your wreath. Love how you used the metal button to hang the sentiment. The embossing is great. So cute. Love the ring of flowers and cute chick. That's a fun sentiment. Cute card. How fun! I love the little chick peeking over the edge! adorable chick and I like the wreath. Such a bright and cheery card! Love the flower wreath and the cute chick peeking out...absolutely adorable! Sankari, your card is gorgeous. I LOVE it. These stamps are awesome and you have brought them to life. Great job! Fun and cute card - like the embossing and layers for your wreath. Cute card, love that little chick. Love this card. Very springy! What a sweet chick card you crafted to share. Love how you added some extra tiny blossoms to make your circle POP! Oh, how fun!!! That little wreath is super cute and I LOVE how you hung it. Great idea. So fun and so cute! Love that little chickie peeking out over the sentiment! Always love your bright colourful cards. This is no exception. Cute little chick popping over the edge there. I love how you've hung the "wreath"! So cute! And the little chick peeking out from the back, cute touch!! 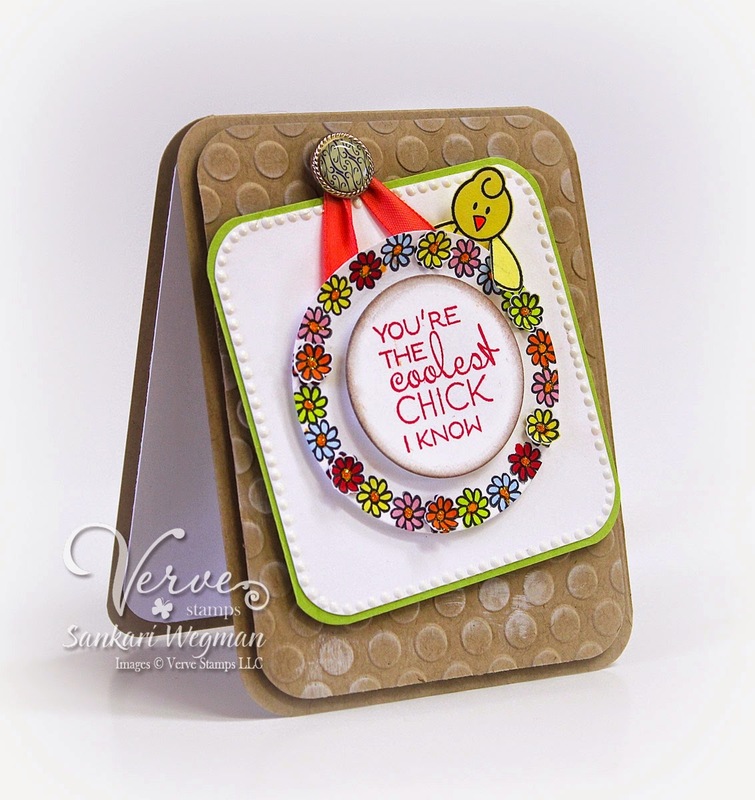 Very cute card...love how you inked up the embossed circles on the base. What a Gorgeous card!! What an ingenious way to incorporate the wreath with the small flowers!! They are so dainty and you colored them so pretty!! the embossed kraft paper is so nice for this cute card! Wonderful bright wreath! I love the inking on the embossed background too! 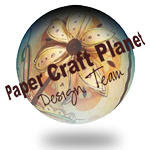 Love that you made a wreath with that little flower stamp! I'd never thought of that, thanks for the inspiration! What a cool design. I really like the hanging wreath. Such a cute chick! Love the layout of your card, the hanging sign, the bright spring colors!